Passengers wait in a Transportation Security Administration line at JFK airport on January 09, 2019 in New York City. 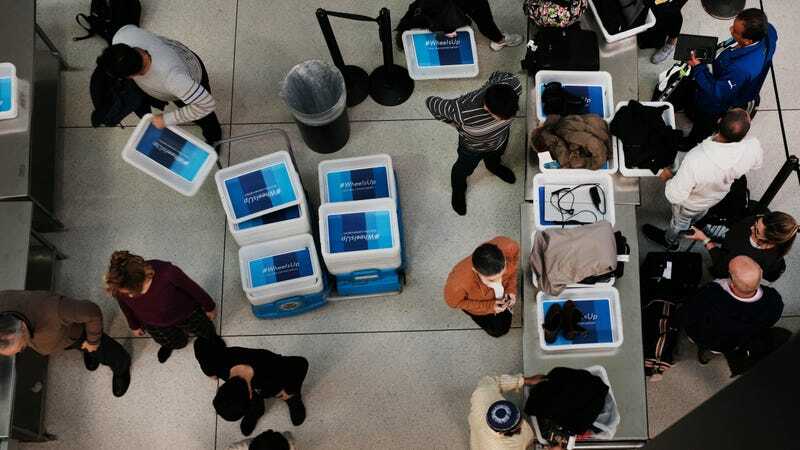 Its been reported that hundreds of TSA screeners and agents have called in sick from their shifts from a number of major airports as the partial government shutdown continues. Even as the Federal Aviation Administration (FAA) strives to imbue confidence in the nation’s aviation system amid the unprecedented government shutdown—now in its 34th day—air traffic controllers, pilots, and flight attendants are speaking out about a “growing concern” for the “safety and security” of airlines workers and travelers. “The situation is changing at a rapid pace. Major airports are already seeing security checkpoint closures, with many more potentially to follow. Safety inspectors and federal cyber security staff are not back on the job at pre-shutdown levels, and those not on furlough are working without pay,” they wrote. The statement was issued by the presidents of the National Air Traffic Controllers Association (NATCA), the Air Line Pilots Association (ALPA), and Association of Flight Attendants-CWA (AFA). The groups have repeatedly warned that the shutdown could accelerate the retirement plans of roughly 20 percent of the nation’s air traffic controllers. Should that happen, the nation’s aviation system “will be crippled,” they said. “I’m not worried about flying right now,” he added, saying that as long as there are TSA officials on the job, “I know the job is being done.” His main fear, he told the panel, is that eventually, federal workers won’t return to their jobs. The FAA last week recalled several thousand inspectors and engineers, which it said were now essential for life and safety since the shutdown had passed the three-week mark. The U.S. Senate on Thursday is prepared to vote on opposing plans to reopen the government—one from Republicans that includes funding for President Trump’s “border wall” and another by Democrats that does not. Neither is expected to receive the 60 votes needed to move forward.